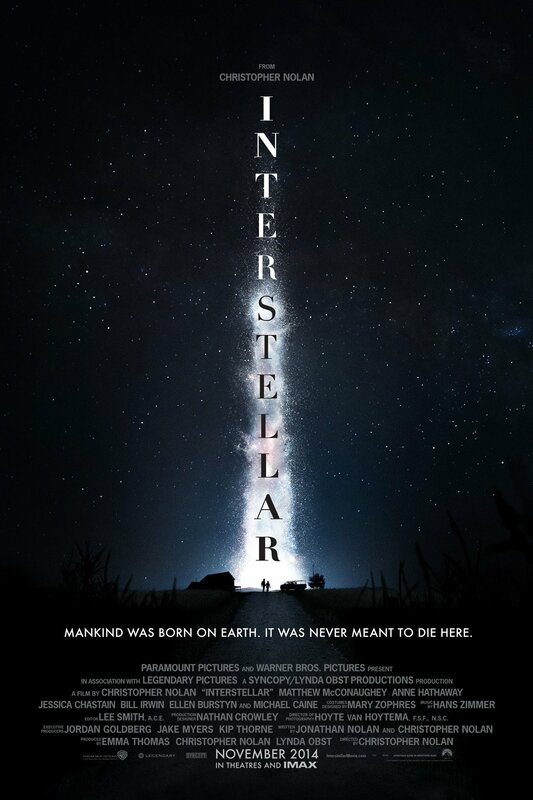 Interstellar is the first Christopher Nolan film I have seen that I am not enthralled with. It’s an overly sentimental melodrama trying hard to duplicate Stanley Kubrick’s classic 2001: A Space Odyssey and coming up short in practically every way. In fact, unlike other films directed by Mr. Nolan which usually feel breathtakingly fresh and original, this felt like a tired retread of other (better) science fiction pictures, like a greatest hits compilation of science fiction clichés. The plot is something Al Gore could have come up with in 5 minutes while waiting to see a doctor. In the future, global warming has destroyed the planet and our misuse and wastefulness of natural resources have made Earth unable to continue to produce food. Animals have all died and we cannot grow any more crops living in a giant dustbowl. We need scientists that are as incredibly good-looking as Hollywood A-listers Matthew McConaughey and Anne Hathaway to save the world by finding another planet for humans to inhabit and colonize. I will not divulge any more plot points but basically say that this premise leads us on an adventure through wormholes in space and when we are not feasting our eyes on big special effects laden cinematography of our heroes voyage through the galaxy, all of which looks like a combination of Kubrick’s 2001 and last years Oscar darling Gravity, we are forced to sit through banal dialogue about theories of space, time and gravity and who cares what else, this movie is boring and at 169 minutes you feel the story being drawn out as much as our filmmakers could stretch the “melodrama in space” story. The camera work and effects are good, but all of it looked so familiar and reminded me of films that did similar effects. When our scientists travel through the space-time continuum we are treated to images that looked strikingly similar to 2001: A Space Odyssey, however not nearly as good, which is a travesty because that movie was made in 1968. When they land on a planet with slow moving water we see giant tsunami waves that reminded me of something straight out of James Cameron’s underwater epic The Abyss (1989). The wormhole concept and story of a father-daughter separation where one must travel great distances for science has been done before and better in the 1997 Jodie Foster movie Contact, which also starred Matthew McConaughey, what a coincidence! This film also took heavily from the 2007 Danny Boyle space thriller Sunshine about a group of scientists on a difficult mission to save the planet because our sun is dying and they need to jump start it with a nuclear weapon. The worst part of Interstellar for me was the music by the usually reliable Hans Zimmer. He is one of our greatest composers of movie scores working today but with this film he kept his fingers on the organ keys way too long, once again reminding the audience that this movie is desperately trying to be Kubrick’s masterpiece 2001 and failing in just about every way. There is one good part, that involves a bit of stunt casting, but it does have a surprise up its sleeve that managed to genuinely trick me until after it is revealed. Then it once again made me think of Danny Boyle’s Sunshine which also has a character do pretty much the same exact thing as the character I am describing from Interstellar. If you see the film you will know what I am talking about, I do not like to ruin plot points or surprises even for movies I dislike. Once Interstellar was over, I immediately wanted to go home and put on the DVD of 2001: A Space Odyssey or watch any of the other films I mentioned in my review. They are all superior works of science fiction that did more for my imagination than even the best parts of Interstellar had to offer. Here is a trailer for 2001: A Space Odyssey. 46 years later it is still one of the grandest science fiction epics of all time. Pretty solid review + valid criticism. I also thought of Sunshine + 2001 + Gravity + The Right Stuff + Contact. I did think (positively) that the film was using the story to send some pretty blunt onions about the state of our space program and general lack of human space exploration in modern times, on the plus side. On the money! And a great read! Thank you. I’m glad you liked my review so much.